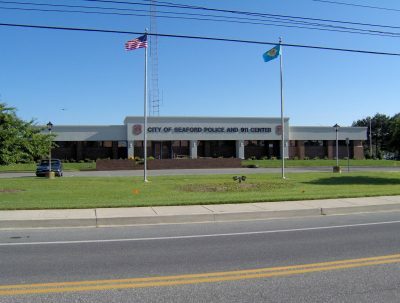 The existing Seaford Police Station, located at 300 Virginia Avenue in Seaford, Delaware, was a 2-story 12,000 square foot brick building that outgrew its ability to serve both a 911 communications center and the expanding police department staff. Therefore, the City of Seaford asked GMB to design a new addition to the existing building as well as the interior renovation and expansion of the existing communications room. GMB provided civil, electrical and structural engineering as well as architectural services for this project. The 2,400 square foot new addition to the Seaford Police Department includes 5 offices, male and female bathrooms, a conference room and a copy storage room. The new construction also included an overall face lift to the front façade including water managed EIFS parapet, columns, signage and lighting. The remaining new construction was designed to match the existing and create an overall seamless transition between old and new. The final total square footage for the new City of Seaford Police and 911 center totals approximately 14,500 square feet. The interior expansion of the existing 911 communications operation required coordination with more than 20 outside vendors to provide new state of the art equipment, furniture and finishes in a timely fashion to the City of Seaford. The design included 4 new 911 work stations each with 5 computers and 8-10 monitors, a raised floor housing all electrical components, a handicap ramped entrance, break area and unisex bathroom. To complete this task additional interior existing space was renovated to house the computer equipment, mechanical and electrical rooms. The overall renovated area totaled approximately 1,390 square feet. The entire facility was renovated during this work to receive both a wet pipe and pre-action sprinkler zoning system. All construction was performed without interruption to daily police department operations and only minor disruption to the 911 communications operation.